Posted on Mon, Jan 16, 2012 : 4:05 p.m. The parent company of five of the largest college bookstores in Ann Arbor and Ypsilanti is considering whether to close 40 bookstores throughout the country. Michigan Book and Supply, located at the corner of South State Street and North University Avenue, may be closed as part of Nebraska Book Co.'s bankruptcy restructuring process. NBC Acquisition Corp.'s Nebraska Book Co., which filed for Chapter 11 bankruptcy protection in June, is closing seven stores and weighing whether to reject leases at an additional 40 stores, company president Barry Major said in a newsletter. 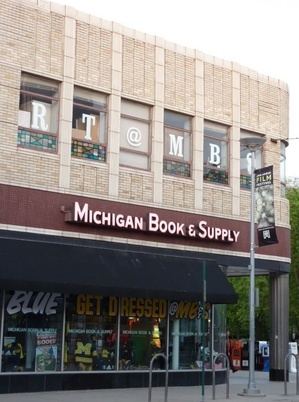 The company owns Campus Book Supply, Mike's Bookstore and Ned's Bookstore near Eastern Michigan University's campus in Ypsilanti and Ulrich's Bookstore and Michigan Book and Supply near the University of Michigan's campus in Ann Arbor. The Michigan Daily reported today that Michigan Book and Supply is among the stores the company may shutter. It was not immediately clear whether the company's other local stores could also be closed. Representatives for Nebraska Book Co. could not be immediately reached for comment. The closure of Michigan Book and Supply would open up a sizable piece of commercial real estate in one of the hottest retail markets in the Ann Arbor area. The store sits at the corner of South State Street and North University Avenue on the edge of U-M's central campus. Nebraska Book Co. said it had "requested that the landlords of approximately 40 additional off-campus stores allow us to continue to evaluate their performance (including Spring Rush) through April 30, 2012, at which time we must either assume or reject those off-campus leases." The news adds to a period of turbulence for the bookstore industry, which endured the liquidation of Ann Arbor-based Borders in 2011. Among the challenges for university bookstores is a move toward electronic textbooks, a shift U-M is considering accelerating. Nebraska Book Co., which recently had to request court approval to adjust its bankruptcy financing agreement, believes it will successfully emerge from bankruptcy court. "While we would like to have this behind us, we are pleased with the progress and remain confident we will successfully exit the Chapter 11 process in the near future," Major said. Tue, Jan 24, 2012 : 7:14 p.m. This makes me so sad, this is where I often bought my art supplies. They have the best variety of Prismacolor markers and their prices are actually a bit cheaper then a lot of places. I am so pissed off by this. Maybe a nice art store will go in. I am so heartbroken. Wed, Jan 18, 2012 : 12:45 a.m. I vote for a Pets Supply Plus. Not much of a reason to go down there anymore. Without Borders and now Michigan Book and Supply the area has lost a lot of its cache. @thinkplease: Perhaps you should learn what a monopoly is before you throw the word around. The article did not say that NBC was going out of business, it said it the company was in Ch.11 Bankruptcy. This however is an inaccuracy on the part of the reporter as the company is actually in Ch.11 Restructuring. There's a difference. As for getting hosed when you sell your books back, the buyback values are based on current nationwide demand. No demand=no value. Regarding your comment regarding &quot;outrageously overpriced&quot; books, the prices are set by the publishers, not the individual stores. Profit margins on textbooks are extremely low. While used copies offer more value to the student, it is up to the professor to make this recommendation. The publishers often encourage instructors to create a new edition which drives the price up, while rendering the prior edition useless and of no value. Tue, Jan 17, 2012 : 4:42 p.m.
Michigan Book &amp; Supply makes a good bit off seliing school supplies and the entire upper floor has what every artist needs. I wouldn't write them off quite yet. A large part of what's driving some of these fantastic businesses out of existence is downtown rent. That is something I would love to see lowered to combat attrition of sales to the internet. Sounds good. What a great building for Dr. Rahmani to buy! Or better yet, a great space for a new 19-story dorm! Anyway, Ann Arbor has far too many bookstores - compared to, say, Port Austin, Michigan. Tue, Jan 17, 2012 : 4:25 p.m.
Just to piggy back on the comments about the excellent art supply department. That will be SORELY missed, and to reiterate what Lulu said, let's hope somebody fills that niche if it becomes open! Tue, Jan 17, 2012 : 2:33 p.m.
Tue, Jan 17, 2012 : 5:34 p.m.
Hi. I don't know where you went to college or what books you were assigned, but instructors do not get a &quot;cut&quot; of book profits whatsoever. No racket there. Maybe your school was different. Never heard of such a thing, though. Certainly in the arts and humanities, we go out of our way to assign CHEAP books (novels, etc) that are widely available in used condition from lots of sellers. Rarely, very rarely, professors assign textbooks written by themselves. But the ones I know contribute that money to a scholarship fund or charity anyway. When one looks away from the bargains in the humanities, some textbooks in other fields are outrageously priced. Good profs don't assign them. Tue, Jan 17, 2012 : 2:26 p.m.
Everything is going digital these days. Textbooks on line? Tue, Jan 17, 2012 : 1:41 p.m. If Michigan Book and Supply goes out of business, there will be no place in Ann Arbor to buy quality art supplies. I hope someone steps in to fill the void. Tue, Jan 17, 2012 : 2:34 p.m.
Word. I hit them up a few times a year for quality art supplies. Tue, Jan 17, 2012 : 1 p.m. I noticed a big difference between the on campus bookstore at EMU, run by a different firm and Neds and Mikes, run by the mentioned firm. Many other universities only have one on-campus book store. I'm old school but when Baker, Bundy, Moore owned Ulrich's it was a top notch operation. Tue, Jan 17, 2012 : 12:41 p.m.
First, I think it is a problem that one company essentially controls all of the text book stores in Ypsilanti and Ann Arbor. This is why the textbooks in these bookstores are so outrageously priced. They are going out of business because the Nebraska Book Co. (and the others like them) is a monopolistic set of crooks. They buy back texts from students for pennies on the dollar and then resell used textbooks over and over again for more than the price of new books. Second, I want to point out (again) that e-readers are never going to be the answer to any problems such as those which feature or are alluded to in this article. E-readers are MORE monopolistic than these massive thieving textbook companies. E-readers aim to place the control of content from publication all the way through its ownership and use into the hands of even fewer companies and people - i.e. not only will e-readers put publishers out of business and thereby placing the decisions of publication into fewer hands as well, but they will utterly control the ownership of content by controlling its format and extending their monopoly to the device(s) which can support that format. Furthermore, e-books will soon be just as (if not more) expensive as hardcopy formats (without the price of the device that supports them). So, the idea that someone could question the &quot;rightness&quot; of one company controlling textbook distribution so comprehensively in any given area but espouse the e-reader as a solution illustrates the ignorance of the American consumer as well as our braindead proclivity to devour unnecessary and ridiculously overpriced technology just because we are told by its producers that we need it. Because monopolistic capitalism is systemic. Let me try to make my point even more clearly that I do above. The Nebraska Book Co. what I am sure was a rather lucrative monopoly on the sales of textbooks at the local level, but now there are larger companies capable of holding monopolies at a higher, more comprehensive level. These two situations are simply different levels of the same systemic process that is further concentrating wealth. The situation is a bit more complex than &quot;any monopoly guaranteeing 'phat cash'&quot;. Tue, Jan 17, 2012 : 2:35 p.m. If its a monopoly why are they going out of business? Monopolies guarantee phat cash. Tue, Jan 17, 2012 : 9:23 a.m.
How is it that one company owns almost every bookstore on campus? How does that make sense. IMO the best thing to happen to text books is the ebook readers. Killing that ridiculous industry and eliminating paper waste has got to be a plus. Tue, Jan 17, 2012 : 12:56 p.m.
Tue, Jan 17, 2012 : 5:39 a.m.
Quote: &quot;The closure of Michigan Book and Supply would open up a sizable piece of commercial real estate in one of the hottest retail markets in the Ann Arbor area.&quot; Are you SERIOUS? Borders Books, Ritz Camera, Thano's Lamplighter and Harry's Army Surplus were all IN that &quot;hottest retail market&quot; area- so what could go wrong??!! ROFL! The closure of Michigan Book &amp; Supply will open up: a BLACK HOLE. The City of Ann Arbor had better hire some honest to God urban planning experts and themselves plan on committing to some major policy changes in how &quot;retail markets&quot; are handled in this town. In regard to the &quot;corporate thinking&quot; that leads to these commercial and civic disasters: someone better do some studying of Zingerman's business planning and personnel training. You've got to FORCE companies to adhere to sane planning and policies, they are currently unable to do it on their own- even if it's to their benefit. Tue, Jan 17, 2012 : 2:39 p.m. The State and Liberty neighborhood has the highest rental rates downtown. When spaces stay vacant, its because the landlords are waiting for the top-dollar leases they think they can get, not because there are no prospective tenants. Any attempt by Ann Arbor city government to &quot;force&quot; businesses to do something would probably be illegal; plus, governments are notoriously incompetent in managing commercial activity. Let the landlords do their thing-- if they overbuild, then a local business can step in and take the space, like Tio's got the Salasarita space. Downtown retail in Ann Arbor is a tricky proposition, so let those who dare take the plunge. Tue, Jan 17, 2012 : 2:36 p.m.
How about a 7-11? I don't like crossing State St. to get to the current one. Tue, Jan 17, 2012 : 3 a.m.
Michigan Book and Supply looks like a great location for a grocery store! Tue, Jan 17, 2012 : 1:52 p.m.
See there, you learn something new every day. I did not know that. Tue, Jan 17, 2012 : 11:27 a.m. It was Ann Arbor's original Kroger, after all. Tue, Jan 17, 2012 : 3:50 a.m. I would put in a Kresge, but that's just me. Tue, Jan 17, 2012 : 2:09 a.m.
Who, or what, owns the building? Dr. Rhamani will buy it. Tue, Jan 17, 2012 : 12:53 a.m.
Will nothing be left of Ann Arbor?! I love that store. My friends who were artists would raid the place for art supplies. In high school I loved looking at the college books. I'd bring out of towners in there to buy U of M t-shirts. It's always been there. And now Ulrich's as well?! I know times are a changing, but that doesn't mean cornerstones of community have to go. Tue, Jan 17, 2012 : 3:14 a.m. It actually still is a great place to buy art supplies which is what worries me reading this article. Depending on what you're getting, they are cheaper than places like Michael's and a lot less difficult for art students to get to (I say this as a former art student). Tue, Jan 17, 2012 : 2:35 a.m. Things change. The place you like is just another interloper to us old guys, and soon there will be students who had no idea you and the places you love were ever here. Welcome to life in a college town. Now if you'll excuse me, I think I'll go pick up a book at Centicore and go over to Drake's to read it while I'm waiting for my movie at the Fifth Forum to start. Tue, Jan 17, 2012 : 1:17 a.m.
That's what they said about the livery stables too. And the Kresge that that used to be there. Mon, Jan 16, 2012 : 11:10 p.m. I love the &quot;other stuff&quot; and Michigan Book and Supply. I guess that would be the &quot;supply&quot; part. Anyway, when you bend people over like they have been doing on textbooks the last few years, is it any wonder somebody figures out a way to put you out of business? I'll miss the store, but not the $600/semester bill. By the way, purchasing textbooks online is really not cheaper than MBS or Ulrichs, at least not with any textbooks I have bought in the last 5 years or so. The electronic versions though, yes I could see how that would put you out of business. Hard to highlight a Kindle though. Tue, Jan 17, 2012 : 10:43 p.m.
Other thing that electronic books do is save the heck out of your shoulders and back. I would appreciate that now that I am not lugging 30-50 lbs of books everywhere.. *But there is a price to pay, in that the device can be stolen easier than a book, and battery life is limited (not so much Kindle but the iPad and other such devices). Tue, Jan 17, 2012 : 2:23 p.m. I have a Kindle, and it DOES allow you to highlight, to add &quot;bookmarks&quot;, and to add notes. Much neater than a conventional book. Also, your highlights and notes are perpetually saved by Amazon. If you're writing a paper, you can retrieve the book with highlights and notes with a computer. The only thing you can't do is highlight in multiple colors. Tue, Jan 17, 2012 : 1:21 p.m. I believe the Kindle DOES allow you to highlight text. I know that the reader on the IPad does. And it can give you a list of all your highlighted text so you can find it again quickly. Hard for a paper book to compete with that. Tue, Jan 17, 2012 : 12:47 a.m. The retail outlets do not &quot;bend you over&quot;. It is the publisher, which is why purchasing online is NOT cheaper, unless of course you find a used one from another student. The beauty now is a book can change hands without the bookstore buying it back then taking a profit to sell it a second time. Craigslist changed that. As for those whining about AA News being doomed due to getting rid of older higher paid workers, the fact is the newspaper business is dying EVERYWHERE. There is no business model which has succeeded online yet for news. Mon, Jan 16, 2012 : 10:53 p.m. Though I love Book &amp; Supply, I vote for a 2-story expansion of 42-Degrees with a dispensary on the second floor. Mon, Jan 16, 2012 : 10:47 p.m.
Bad reporting once again. What is happening to Nebraska Book Company is what happens to any clueless corporation that comes in, fires staff, guts the business and then hires employees who have no skills but work on the cheap. This is just one more example of cut and paste journalism that leaves out about 90% of the story. Maybe if Nebraska hasn't pushed out older, higher paid staff in places like Ulrich's Books and replaced them with minimum wagers with no book selling experience this story would have turned out differently. But we won't get that story here or from AnnArbor.com. Tue, Jan 17, 2012 : 11:57 a.m.
Not sure what books The Mayor mandates for his feather bed created class at the U of M...lol. Tue, Jan 17, 2012 : 11:12 a.m. I'm surprised you didn't blame the mayor for the book store's problems too. Tue, Jan 17, 2012 : 3:53 a.m.
What would a 50-something employee have to offer that a $10 an hour employee does not? Students are told by their professor what books to buy. They can either buy it at a brick and mortar store that the professor contracts with, or they can go to the internet and buy it from any number of online bookstores. When they go online, it will be cheaper because the e-store does not have the overhead that the brick and mortar store deal with. It's not like the e-store has better customer service...it's all about price. Mon, Jan 16, 2012 : 11 p.m.
Ironically, didn't AnnArbor.com push out older, higher paid staff and replace them with minimum wagers with no journalism experience? :) I guess that's what we get. Mon, Jan 16, 2012 : 10:35 p.m.
And BN is a chain in big trouble also. Have we seen the end of bookstores? I hope not. Nothing nicer than walking into the bookstore and being able to see the books, buy them, etc. And MBS always had nice Michigan stuff. Mon, Jan 16, 2012 : 10:24 p.m.
Tue, Jan 17, 2012 : 2:32 p.m.
Spring Rush? No such thing at UM. Tue, Jan 17, 2012 : 1:28 p.m.
@AEM Michigan Book and Supply didn't have most of the books for winter term. Professors ordered the books and the students went in to be told 'sold out'. My daughter had to order several books on line because they were not available in the stores that were supposed to be selling them. Tue, Jan 17, 2012 : 3:49 a.m. The problem with your comment is that you fail to recognize that students buy most books two times per year. U of M is in the middle of their Winter Semester. Students have already bought their text books for the current semester. Why would the store have shelves full of text books when students have no reason to buy them at this time? The more important issue here is that college bookstores have been slowly fading for a long time. Technology has caused a major shift in many industries, and brick and mortar stores, along with real paper textbooks are becoming obsolete. Academic publishers cannot compete with online publishers and professors who illegally post copyrighted articles for their students to download for free. Who is the real problem?...Many professors themselves who demand absurdly high royalty fees. Mon, Jan 16, 2012 : 10:10 p.m. When Michigan Book and Ulrich's fired all the people who managed the spirit wear a few years ago, they sealed the stores' doom. The margins on textbooks are going to continue to decline in the face of online competition, and they walked away from the one strong business they had outside of textbooks. I have fond memories of working for them in the 1990s, but Nebraska Books's time has come. Mon, Jan 16, 2012 : 10:07 p.m. I'm really sorry to see this. Michigan Book and Supply carried many other items besides textbooks and was a good anchor for that corner. I'm wondering where it will be possible to buy textbooks locally if it closes. I understand that online ordering has become prevalent and that the UM has also endorsed the use of ebooks, but surely for some classes, especially special-topic small classes, a place to buy physical books is still needed. Tue, Jan 17, 2012 : 3:11 a.m.
My guess would be that students would be forced to buy those 'specialty' type books at the Barnes &amp; Nobles stores in the union and in the dude. My opinion as a recent grad, anyway. Mon, Jan 16, 2012 : 9:38 p.m. Given the price of textbooks, how could a college bookstore possibly go bankrupt? Mon, Jan 16, 2012 : 10:36 p.m. The businesses that sell textbooks are not the same as the businesses that publish textbooks. Mon, Jan 16, 2012 : 9:45 p.m. The same thing that happened to Borders and Shaman Drum: online orders. Mon, Jan 16, 2012 : 9:34 p.m.
No doubt another coffee shop would take it's place.